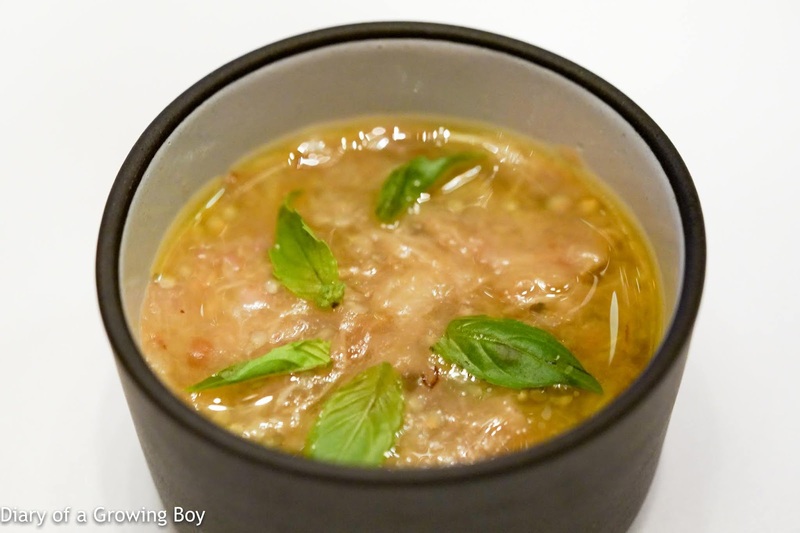 Eggplant caviar with basil - with some surprising acidity here. Spread over the sourdough. 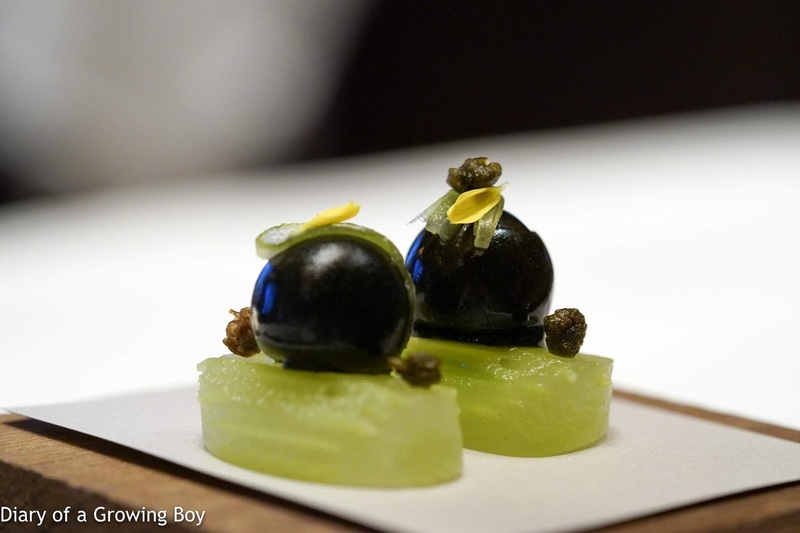 Salty: celery topped with soy-marinated black bean, dried capers - the big chunks of celery were very refreshing with totally cool, summer flavors. The black bean purée was alright. 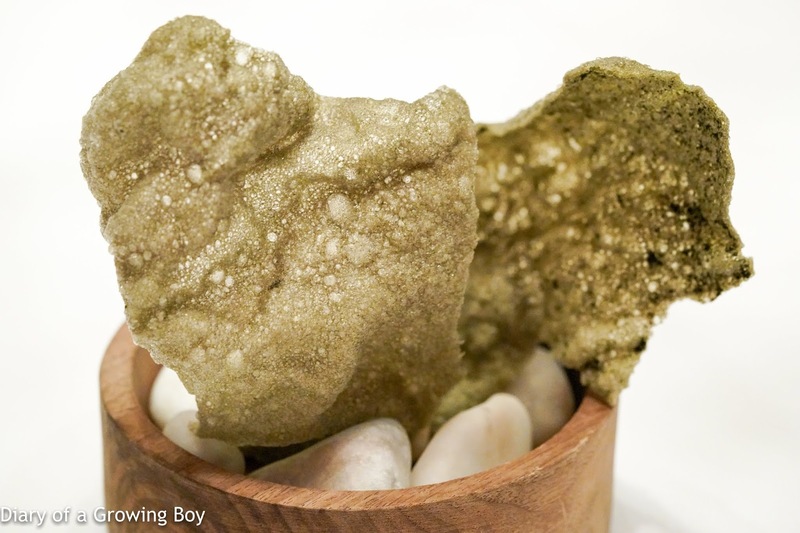 Sour: lemon meringue - nice and tart, with a soft center. 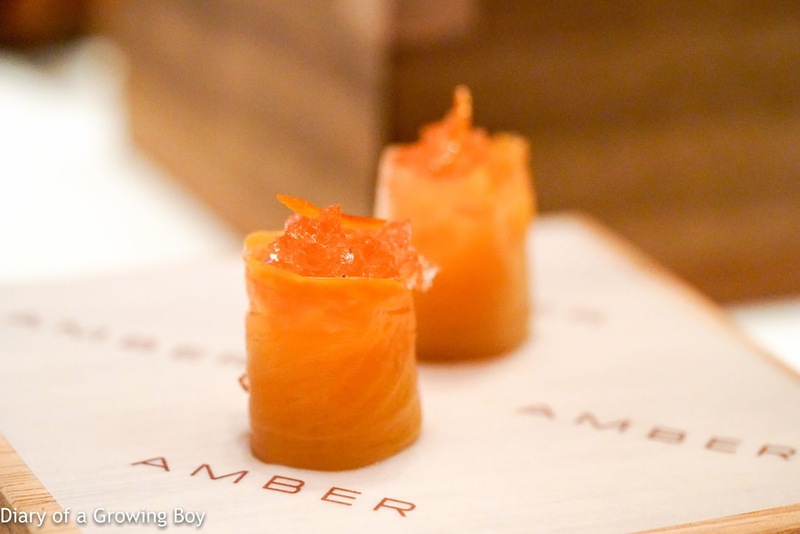 Bitter: endives with orange Campari jelly - certainly very bitter, with a soft and creamy center topped with citrus zest. 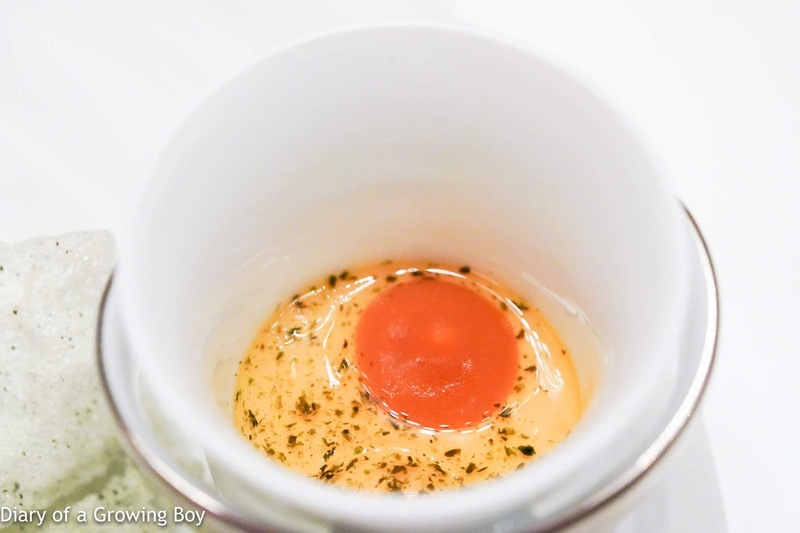 Umami: egg custard with fruit tomato compote, topped with seaweed cracker - the texture of the custard was too hard tonight for my liking. 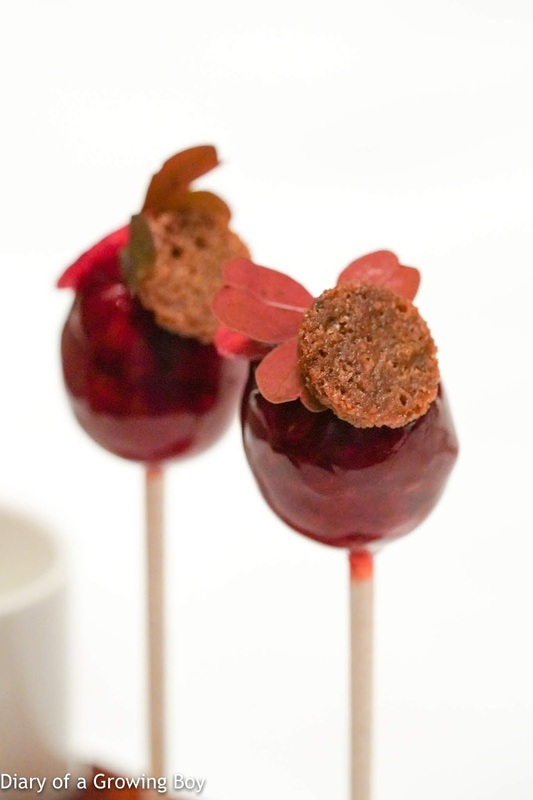 Duck foie gras: Chupa Chup with beetroot and raspberry, topped with crispy gingerbread and sea salt, 2005 - ah yes... This certainly counts as a classic item. 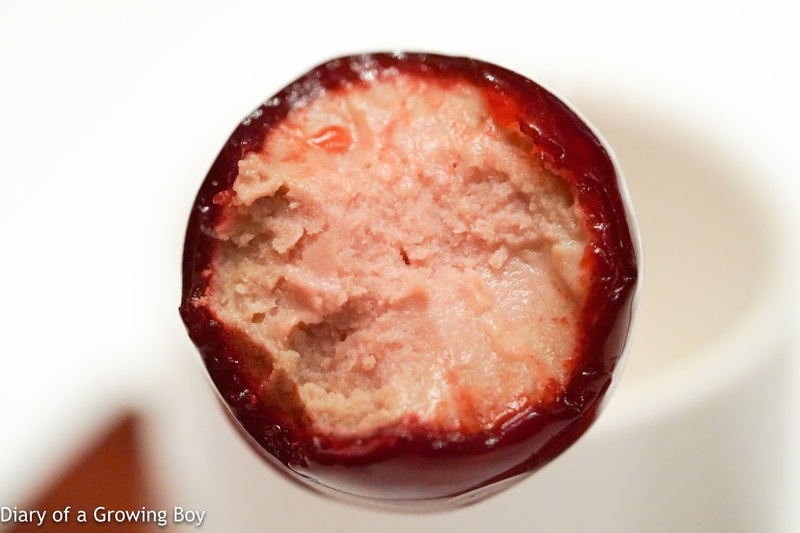 The smooth beetroot and raspberry coating kept the creamy foie gras center hidden. Still delicious and fun to eat after all these years. 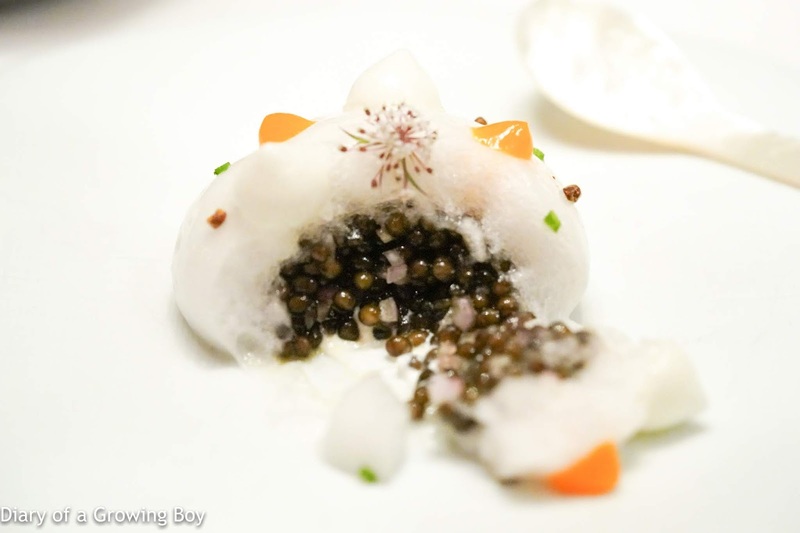 Kristal schrenki caviar: and vodka foam, a la russe with crispy buckwheat crêpes (15g of caviar) - the first dish that Richard sent us from the kitchen to try. 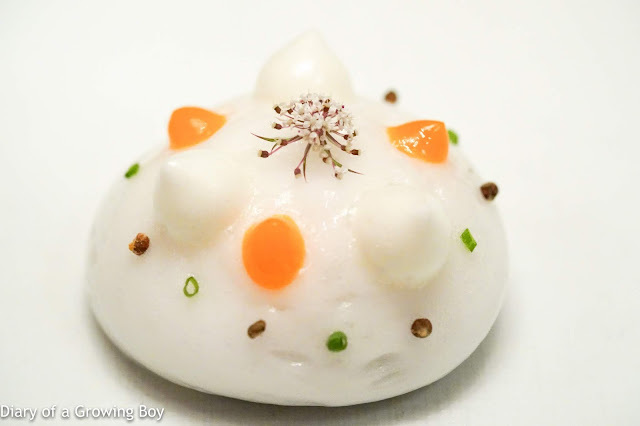 Hidden underneath the layer of Belvedere Vodka foam - topped with, we were told, egg yolk cream and egg white mayonnaise (in reality meringue) - were 15g of caviar farmed in China, along with some finely chopped garlic (or so we were told, although I thought it was onion). 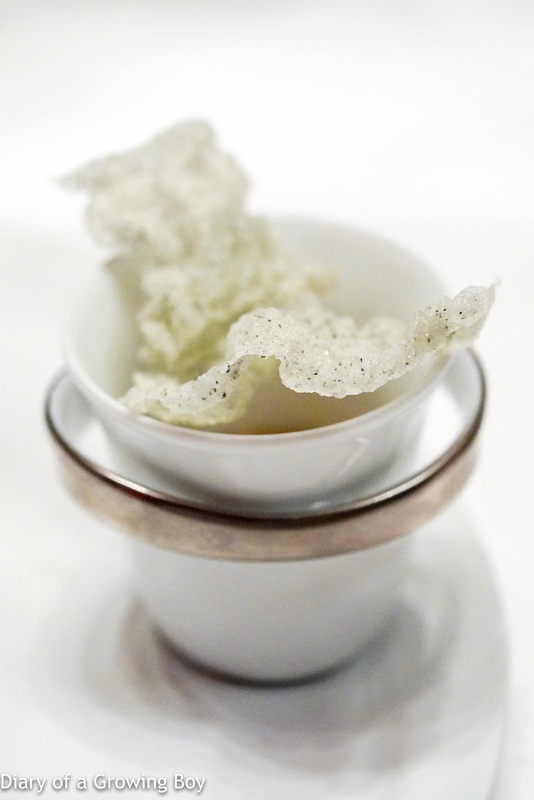 In all honesty, I found the vodka foam slightly bitter, and really needed the very toasty buckwheat crackers on the side to balance things out. 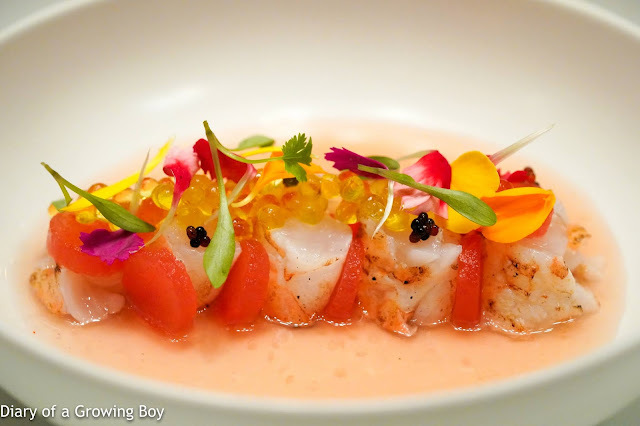 New Zealand scampi: in organic tomato and watermelon 'nage', with espelette chili and coriander, 2008 - this dish was created during the early days of the restaurant when I wasn't such a big fan, so I only had a different version featuring pork belly. This was excellent and almost my favorite dish of the evening. The lightly-cooked scampi came in sections, with watermelon discs sandwiched in between, and surrounded by a nage made of tomato, watermelon, and (reportedly) strawberries. Topped with some scampi caviar, olive oil caviar, coriander, and edible flowers. 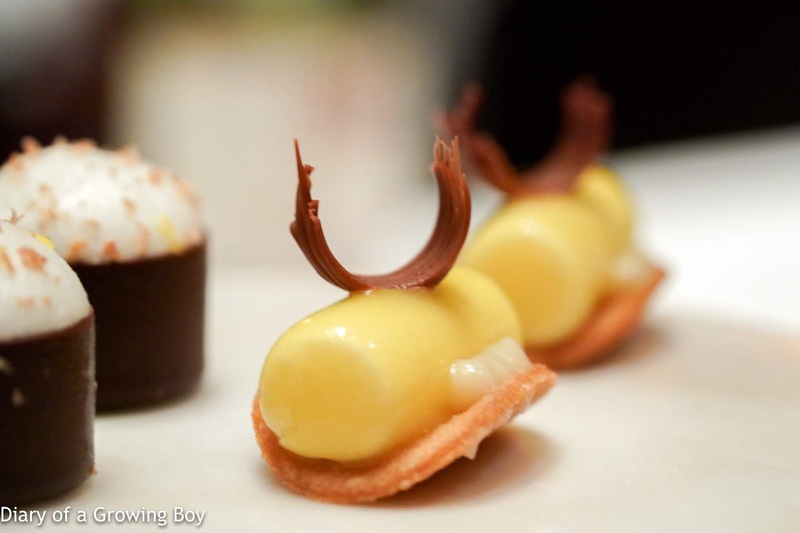 A beautiful mélange of flavors - with sweetness and acidity to work with a bit of umami. 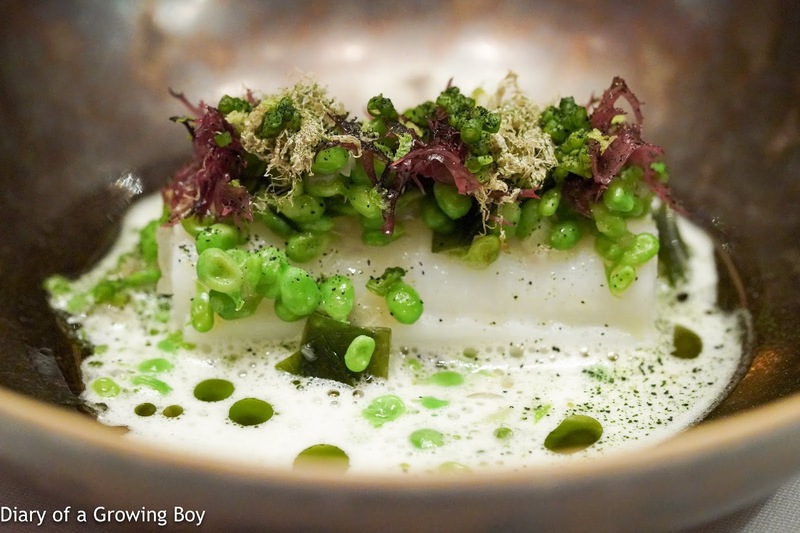 A chilled dish that was so refreshing in the summer heat. Heck, even looking at the bright colors brought instant happiness. 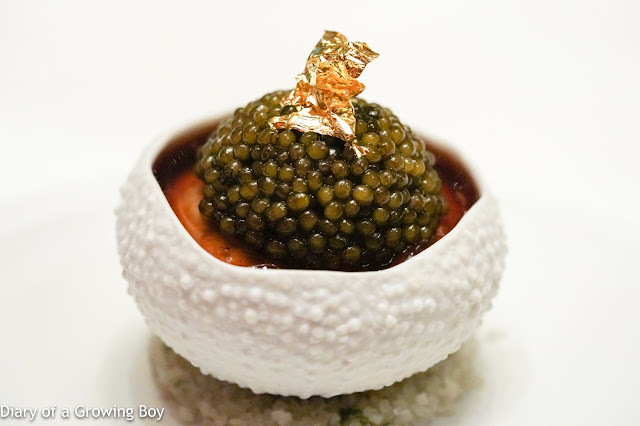 Hokkaido sea urchin: in a lobster jell-O with cauliflower, Kristal schrenki caviar and crispy waffles (15g of caviar), 2006 - oh my dear friend, how I have missed you! It's been more than 2 years, but I gotta be honest... you looked a little different tonight. 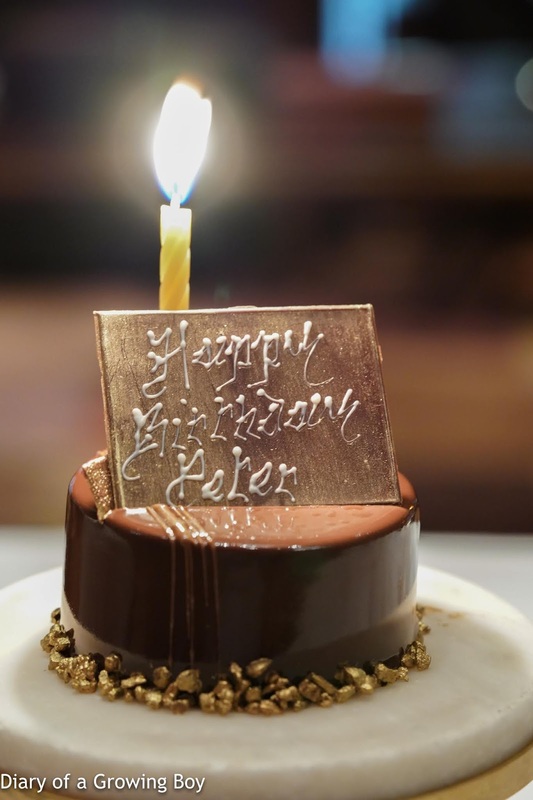 One final gripe: why was Richard so stingy with the gold foil???!!! Doesn't he know how much I love it? 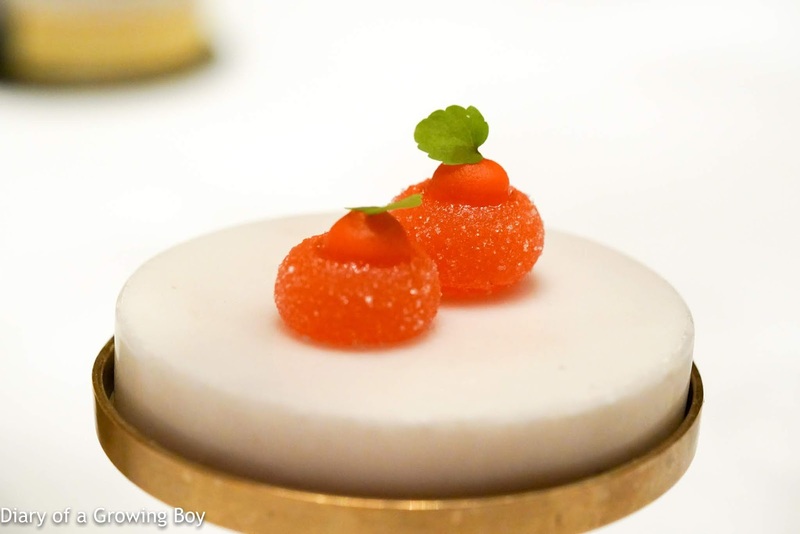 I always used to eat the crispy seaweed cracker separately from the caviar and sea urchin, because I could never wait to dig into the dish, but tonight I did find that the combination was beautiful. Aori cuttlefish: ribbons confit in kombu infused extra virgin olive oil with sweet peas, wakame and shallots, buttermilk emulsion, plankton dust and torroro kombu - the second dish that Richard sent out for us to try, and a real beauty it was! 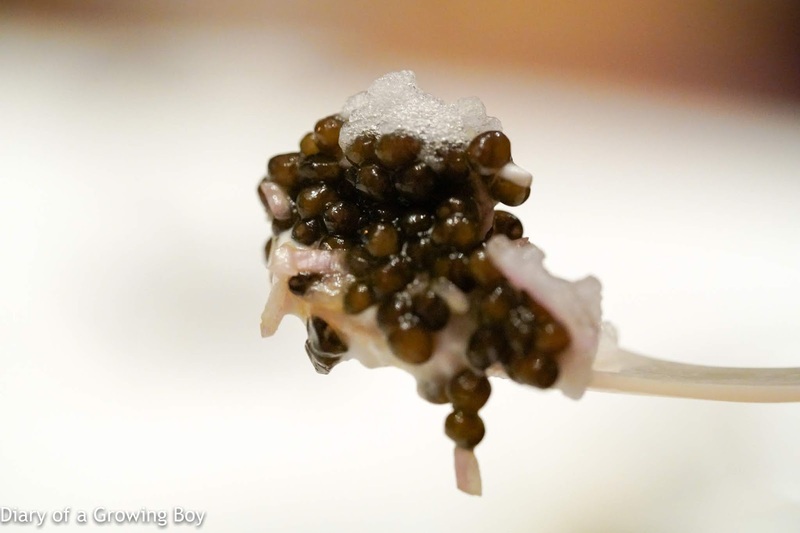 The bigfin reef squid (アオリイカ) came rolled up in a tube, already sliced into sections and scored into ribbons. I absolutely loved the bouncy, springy texture. 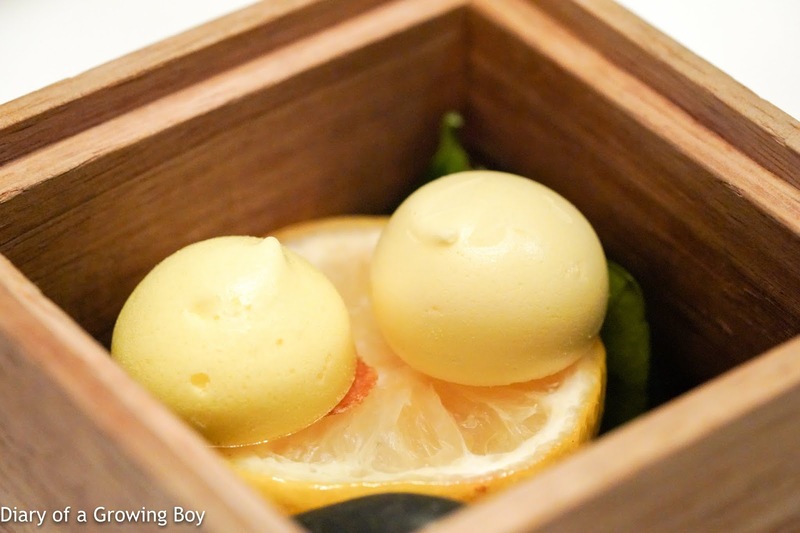 The buttermilk emulsion delivered a nice dose of acidity along with creamy richness, while the kombu (昆布), the kombu-infused oil, wakame (若布), and tororo kombu (とろろ昆布) provided plenty of umami. And then we have the small, sweet peas adding their (what else?) sweetness into the mix. Wow! 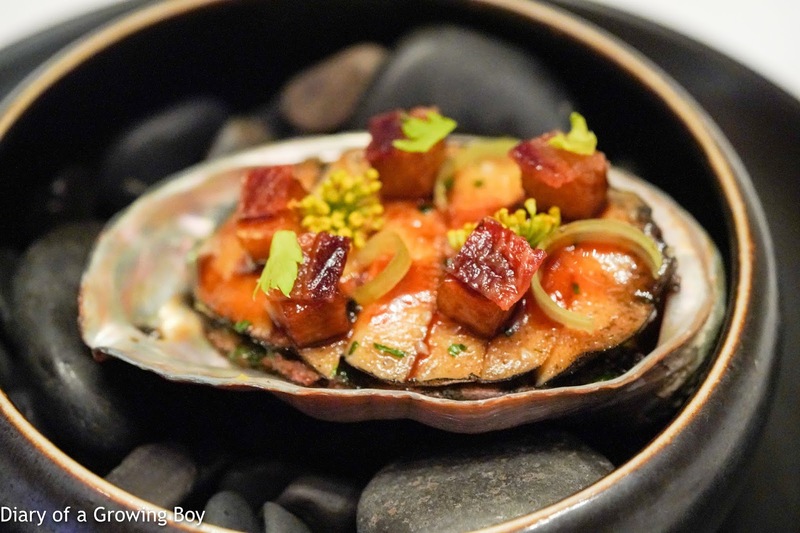 Kuro awabi black abalone: with a spiced chickpea compote, stewed tomatoes, crunchy celery stalk, braised pork chin and crispy pancetta, 2014 - yes, I remember when this dish was introduced. The abalone was, of course, nice and tender. The combination of spiced chickpea and tomato was pretty interesting. The little cubes of pork chin and thin slices of crispy pancetta lent their fatty goodness to the dish. 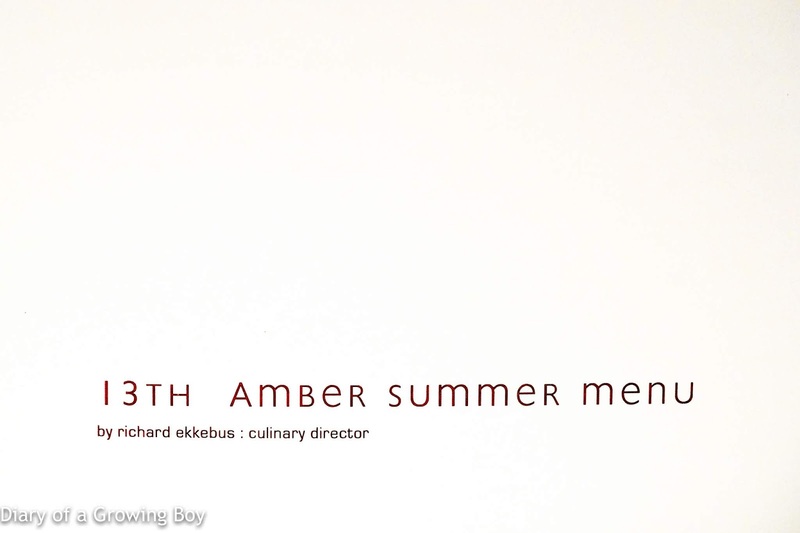 The only thing which marred the dish for me was the hint of star anise. Hakoo Farm Miyazaki wagyu beef: strip loin; dusted with dried red onion skin and dulse seaweed powder, red pearl onions with black currant in a shiraz reduction, 2017 - it's hard to imagine that this dish has already become "classic" when it only came about last year. The Japanese beef from Miyazaki was perfectly executed, and certainly no fault could be found with the ingredient itself. The acidity from the blackcurrant and shiraz reduction helped balance out the fatty beef. Buffala buratta: with 'fleur de sel' Amao strawberries, Amela Rubins cherry tomatoes and bronze fennel - the third and final dish Richard treated us to, and this was also a hit with us. 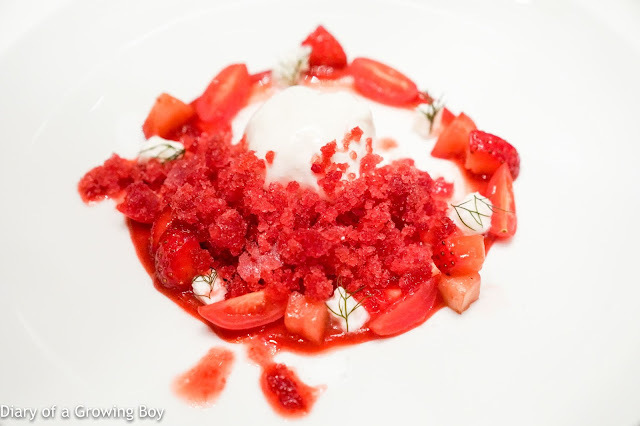 The burrata mousse in the middle was surrounded by powdered mozzarella, a mix of diced Amaou (あまおう) strawberries and Amela Rubins (アメーラルビンズ) cherry tomatoes, topped with strawberry granita. There was a good balance between creaminess and sweetness, and very refreshing. 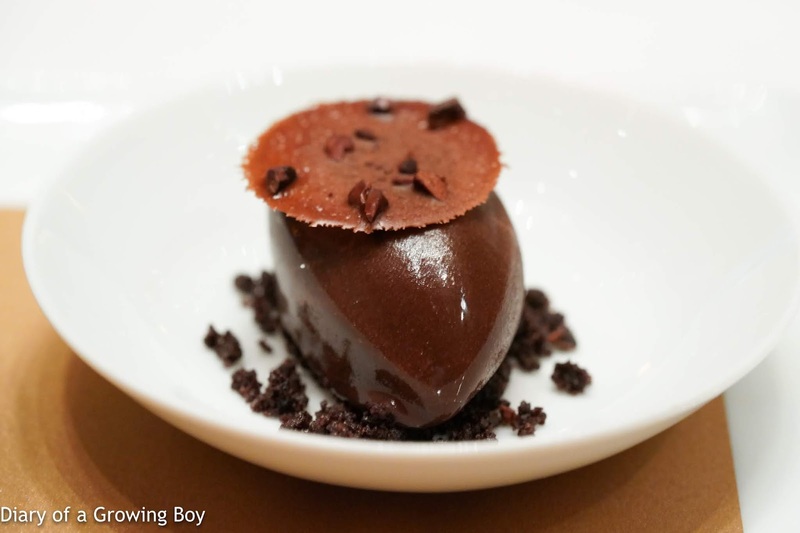 Abinao 85% chocolate: soufflé with cacao sorbet, 2006 - unlike the last dessert, this was rich and sinful. 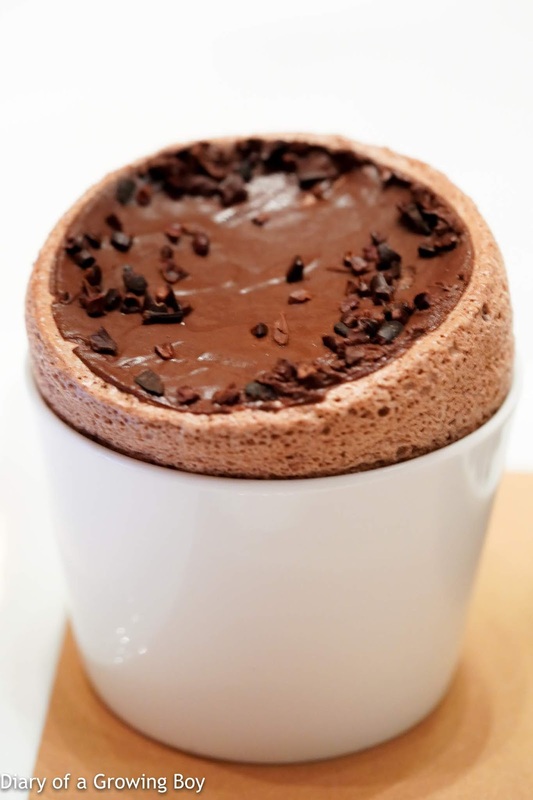 A deliciously sweet chocolate soufflé, into which I added the bitter cacao sorbet and cocoa nibs. 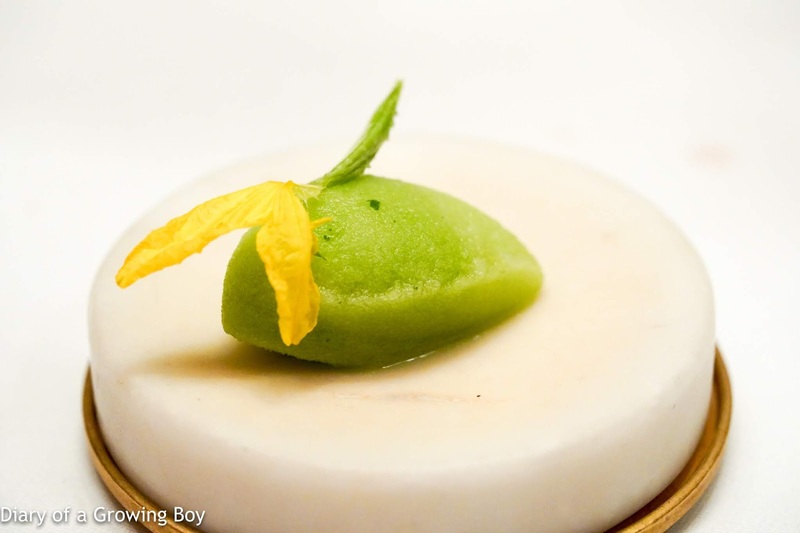 Cucumber sorbet - with refreshing minty flavors, and a baby cucumber/cucumber flower garnish. 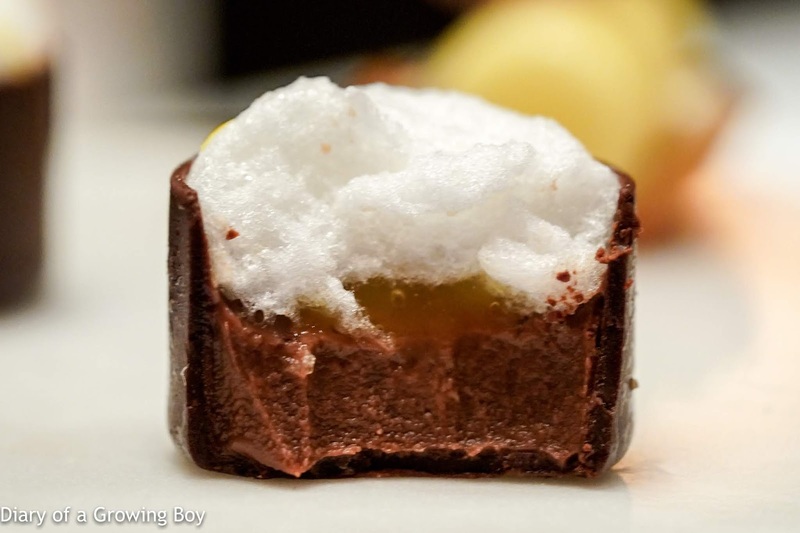 Ginger chocolate - the foamy meringue on top did taste of ginger, and there was a layer of caramel in the middle. 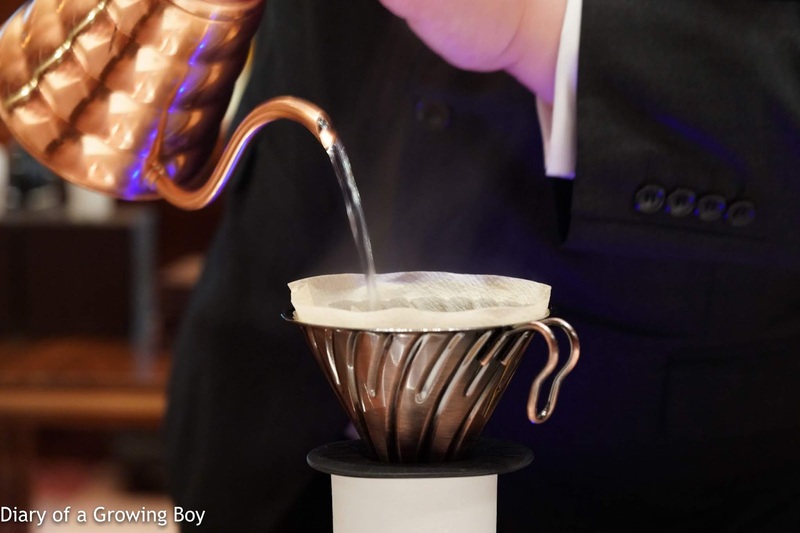 They upped their coffee game recently, and now offer tableside pour over service. I chose the Yirgacheffe 'Grade 1', which was medium roasted. John came to explain the meticulous way this coffee was going to be brewed, with 333ml of water being poured over 20g of coffee grounds to yield around 290ml of coffee. 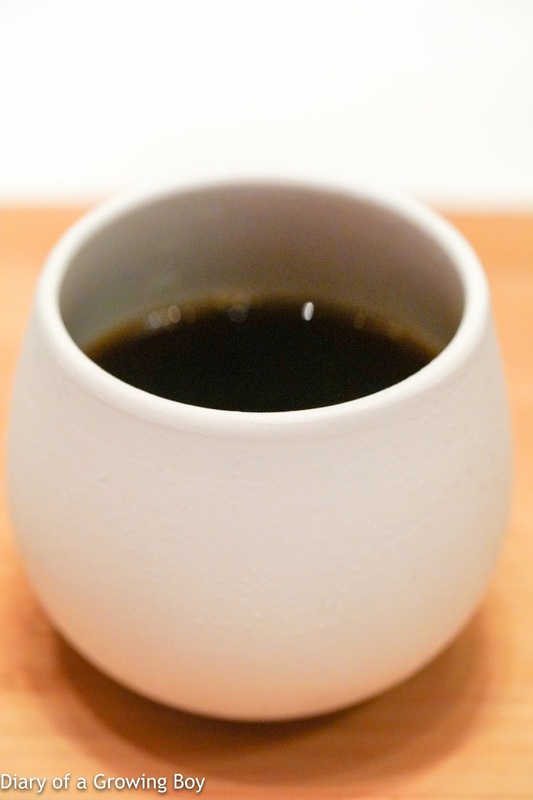 I gotta say that this seemed to be a heavier roast of Yirgacheff than what I'm used to drinking at home, so I didn't get the same level of acidity and lightness. In terms of wine, we started the evening by ordering a glass of Champagne from the wine list. 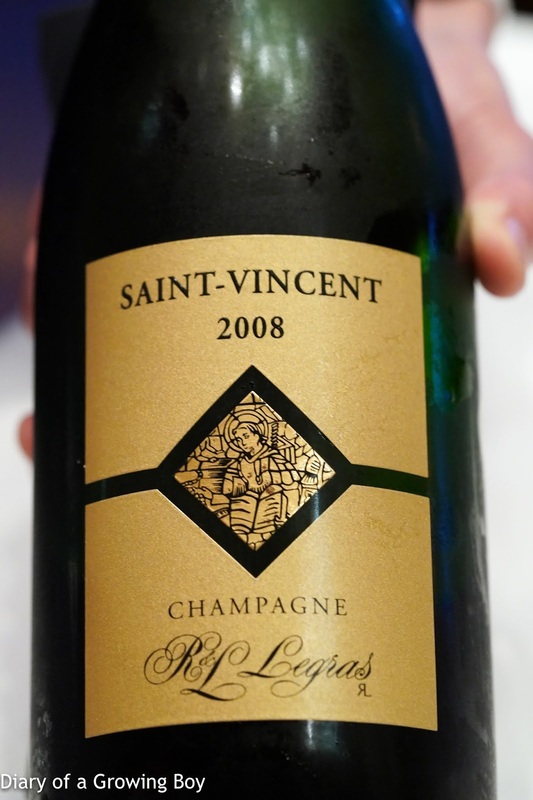 2008 R et L Legras Saint-Vincent - nice and full-bodied, with a lovely, fragrant nose. Given that this was a "birthday dinner", I chose to bring a bottle of wine from my birth vintage. Unfortunately I did not realize until after the first couple of sips that I had brought the wrong wine. In fact, I don't even remember buying this wine... as I had assumed that I had only its more famous cousin in my cellar. John must have been wondering why I even bothered to bring such a pedestrian bottle to the restaurant... when the corkage they were charging was more than the cost of the bottle itself. 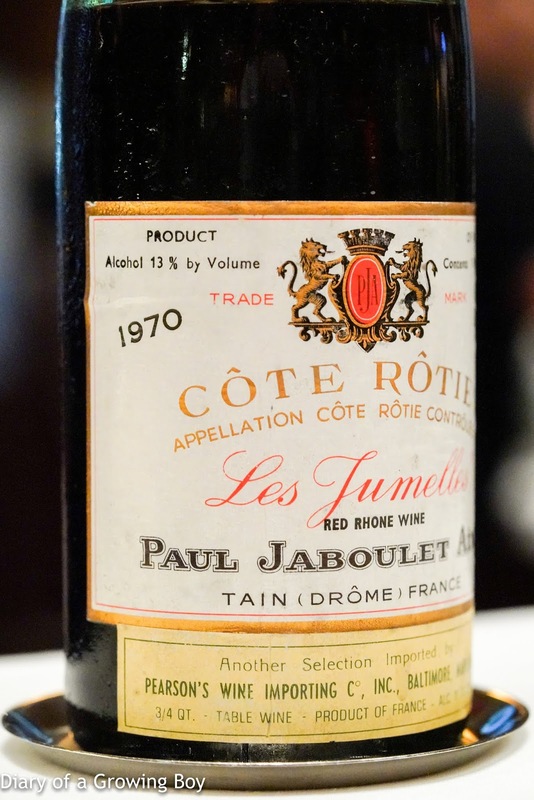 1970 Paul Jaboulet Côte-Rôtie Les Jumelles - a little stewed prunes showing in the nose, with savory black olives and soy sauce. Also a hint of chalkiness. This was a very, very good dinner. 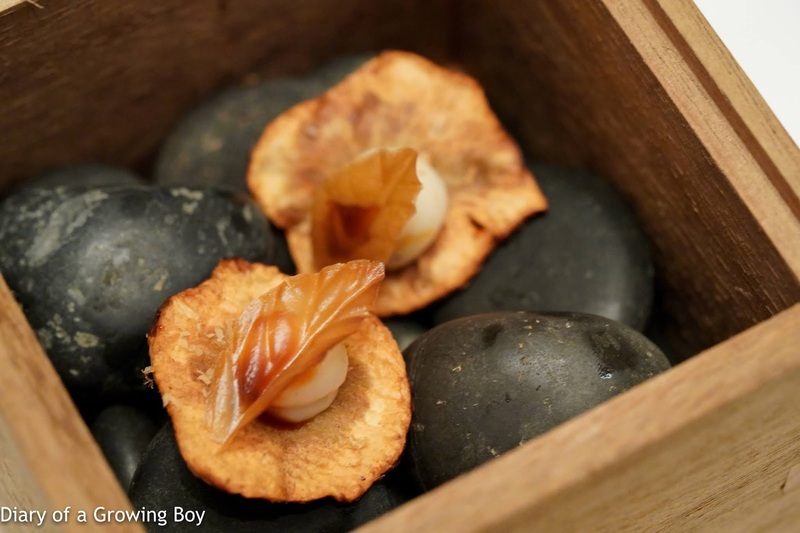 I was very happy to have had another chance to enjoy my beloved (and dearly missed) Hokkaido sea urchin dish, and also glad to have had a sampling of the new dishes coming out from the kitchen. Many thanks to Richard for the extra goodies, and thanks to the team for looking after us.